Rainbow pedestrian crossings are now a Thing – typically to celebrate Pride somewhere, but also springing from use of bright beautiful paint on intersections to encourage more alert and courteous driving. Trouble is, you’re not allowed just to paint any old thing on the road in New Zealand. The NZ Transport Agency tightly controls what they and councils (who are responsible for state highways and local roads respectively) are allowed to paint. Everything that tells you what to do on the road is a “traffic control device” governed by the Manual, and cannot be fiddled with or modified. Yes but someone might die! Mostly the concern is that if road markings aren’t consistent everywhere, people will misunderstand what they’re supposed to do. From the “no passing” lines on state highways, through the “pedestrian crossing ahead” diamond and the stripey poles by the crossing, to the green/red man signals, in New Zealand markings tell us everything and are supposed to be obeyed. Someone may be injured, or die, because they were confused by a road marking or other “traffic control device” that was unusual. So everything is very tightly controlled and tested. For example, sharrows – the harmless (and largely ineffective) “share arrow” you’ll see on Victoria Street, and the Kate Sheppard / ANZAC soldier / Carmen pedestrian signals, had to be comprehensively tested [2.8MB PDF] to make sure no-one would get injured by misunderstanding them before they could stay (Nicola Young was, no doubt, relieved.) In Auckland, it’s been challenging to get some slightly different pedestrian crossings reconnecting bits of Māngere severed by a big road. Exhaustive testing makes a lot of sense for some new “traffic control devices” in some contexts (higher speed ones for example! ), but sometimes we gotta ask… is this extreme caution suppressing towns from making their streets more people-friendly? 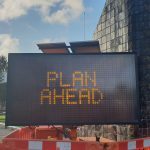 We’re looking forward to more innovation from both councils and NZTA now the government’s putting much more transport spending focus on people – i.e. things we’re not very used to catering for. Hopefully they’ll feel more comfortable giving things a try and seeing how they work. But meantime, Wellington City Council is forging ahead. 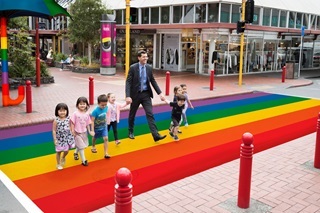 Whether they’ve got permission or are going to ask forgiveness of NZTA afterwards, they’re installing a rainbow crossing at the corner of Cuba and Dixon this weekend. It’s not being trialled, they’re just doing it. (Pleasingly, Breakfast TV’s attempt to raise people’s ire about the cost saw an interestingly diverse comments thread – much of it supportive of the costs of traffic management for installation). Much of the cost is in the road closure to install the thing – these signs are expensive! Also it’s not just paint, it’s a built-up “raised table” crossing which will help us drivers actually slow down for it. Plus it will look awesome! We’re over the moon we’re getting a raised rainbow crossing. The Edge is hosting an unveiling party – see you at 4pm on Cuba and Dixon Wednesday 10th October everyone! Have you seen a cool painted street somewhere you want to share? 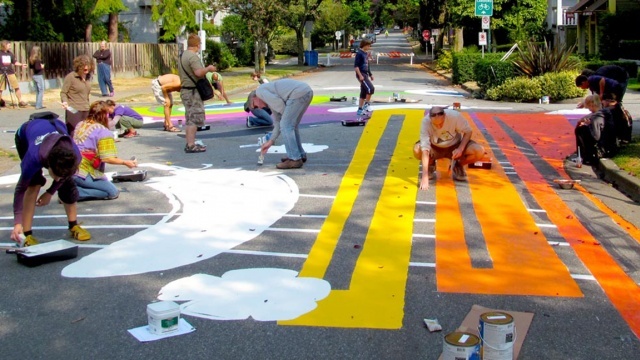 Where else could do with a rainbow crossing in your ‘hood- or even just a crossing?